So let's see... somewhere back in September I was hoping to get back on the blog train. I feel like such a flake. I have some excuses, but you don't want to hear those. So, I'll give you some keywords instead: lost camera battery charger, quickie trip to Vancouver, new & intense work project, Thanksgiving, B out of town, insane pets. Recently, however, events have turned - thanks in no small part to last week's Black Friday sales bonanza. The background is this: Rather than struggle to buy each other presents for Christmas, B and I tend to just buy a big item, wrap it, and put it under the tree. There's definitely a certain lack of mystery with this scheme, but no shortage of anticipation come Christmas Day. So, ta da! I took a bunch shots of old FOs, some new(er) WIPs, and even a bit of stash. Mmmm stash. Pattern: My own, based on a formula in "The Knitter's Handy Book of Patterns" by Ann Budd. Thoughts: Meh. Sure it's soft and snuggly, but I really wish the cables were chunkier. They look wussy in this yarn. 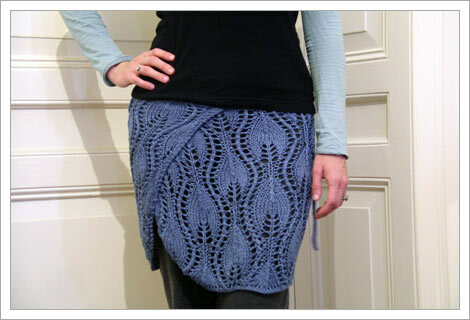 This has been uploaded to Ravelry for AGES. I didn't show it off for no good reason other than I really wanted to get shots of it in action. B never quite cooperated, and now it's full of lint and pet hairs. You'll have to believe me that it looks super sharp with B's overcoat. Very manly. This was my big project last Winter (I know, a hat, right??) - the copycat hat for my friend's birthday. Promised to her in November, I didn't hand it over until March, just in time for the last cold weekend of the season. Everything conspired against me from having difficulty finding the colorway she wanted, to knitting and ripping it out about four times. You may recall that I was trying to reconstruct the Peruvian Hat listed for $259 in an issue of "Real Simple." In the end, I didn't include the garter stitch, but the rest was pretty close. 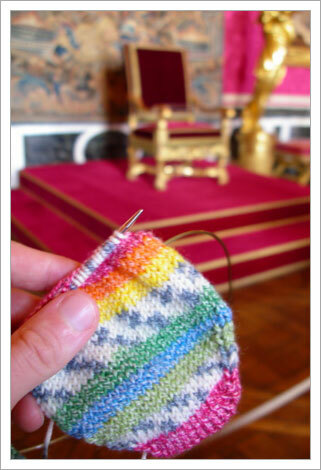 Mods: I knit the socks toe-up (of course), and ended up reducing the number of stitches from 60 to 48. 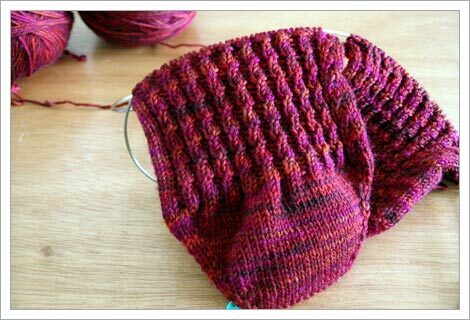 I have only four stockinette stitches between the yarn over pattern bits. Well, what can I say? There they are. I like to think of them as "so ugly they're cool" but I haven't decided if I'm kidding myself. I can say for sure that I think the colorway and pattern work well together in that the combination produced the crazy mess that I was expecting. If it was 1989 I might feel more enthusiastic about these socks. These would have matched perfectly with my black tights and Doc Martin 8-hole boots. These days I'm not so dark and frowny, so who knows what I'll wear them with. I'd like to note that the socks actually are the same length. I just bound my cuff off a bit too tightly. One of my calves is beefier (haha!) than the other, so the "longer" one is just on my wimpier leg. 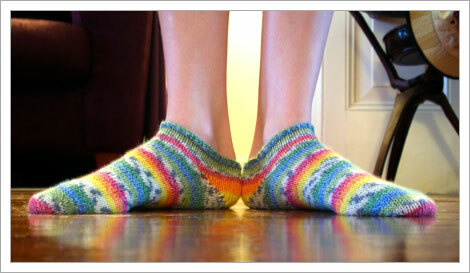 The pattern was ridiculously easy and a cinch to tweak to fit my miniscule feet. 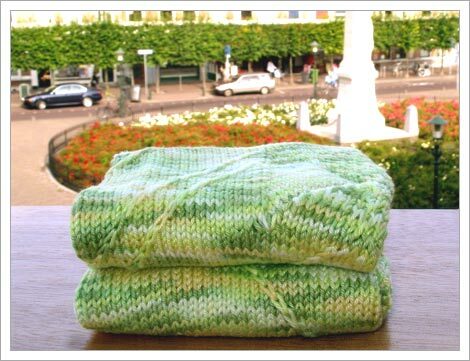 The stitch pattern is produced by creating and then dropping yarn overs. The only tip I can provide is to pull the yarn-over bits all the way through when you go to knit the next stitch. This will save you the hassle of having to "fluff" up the stitches later. The pattern also more-or-less kept the colorway from pooling, and the bruisy bits that appeared on the one sock still kind of work. Speaking of bruisy bits... yes I am one of those girls that always has scrapes and scratches on her knees. This week, though, it happens that my shins are mangled. So those pink bits on my legs aren't there for effect. At least not intentionally. I did try to find a gnarly spot to take the photo though. Grrrrr! Don't mess with my socks in their bad neighborhood, yo! In spite of my strong dislike for the colorway, the Colinette Jitterbug is nice to knit. It's a bit thicker than other sock yarn and very squishy. It is rumored to "bloom" when washed, so I actually made and washed a swatch before I settled on my needle-size. But once I got started, I still knit the pair to my foot size (I was running out of stitches to reduce) so it's possible that they'll be too big in the end. I cast these on in Holland so I could knit them on the flight back to D.C.. I actually managed to turn the heels on the plane, but then "all things knitting" ground to a halt once we arrived. I lied to you the other day. I didn't end up finishing them during "Heroes." I was too lazy to go upstairs and get my needle for the sewn bind-off. D'oh! Instead, Tuesday I tossed them in my sock bag and trotted over to Knit Happens where I hung out with the lovely Wry Punster and KnitGirl. I even skipped a yoga class (one I was going to take, not teach!) to finish the job. Punster and Girl were so gracious to shower much praise and imaginary confetti on my fugly FOs. It took everything I had to sit myself down and bind off, what with all the eye-popping yarn everywhere. I pet some fine, fine fiber and ogled many an oft-dreamed of sock yarn. The highlight was finally getting to see the Fleece Artist yarn in person. It's better than I ever imagined. However, I have to admit that I'm a bit over-saturated with sock yarn at the moment. I have gobs of it in a wide array of colors already. As much as I enjoyed oohing and aaahing over their room-o-sock-yarn, there wasn't anything there that was significantly different enough to justify buying. I'm not one to buy a sweater's worth of yarn when I don't have a pattern in mind, so lately I've been on a scarf and hat kick. A couple skeins of worsted/DK/chunky goodness go pretty far towards satiating my yarn-hoarding demons without busting the wallet. 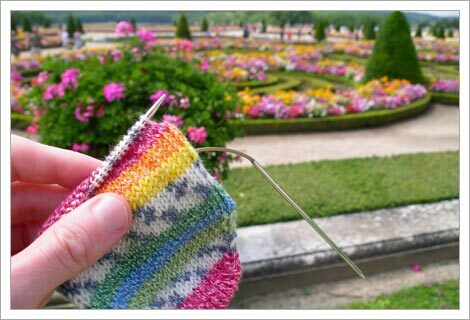 In a way, these little low-commitment projects are more satisfying that knitting socks. 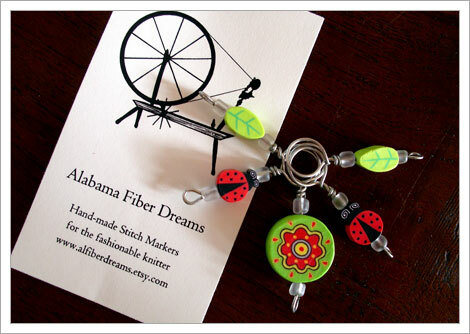 There's no issue with fit, and you can justify buying things like Alchemy Yarns Silken Straw. It looks and feels a bit like raffia, but the super saturated colors jump off the shelf and shake you down. I'm told it softens up a lot when knit, but I'm not sure I even care. 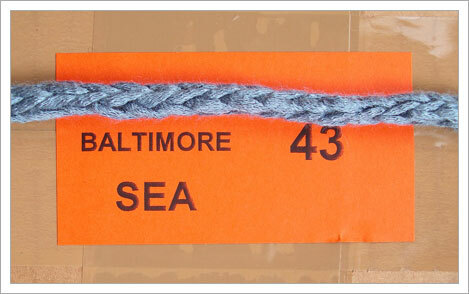 Taking a page from the Knit Happens sample book, I'm going to make Knit & Tonic Wendy's Dream Swatch Headband tie thingie. I actually need a headband, and I don't like the hard plastic ones from stores. A'ight. Purchase justified. Now, all I need you guys to do is tell me what I could make with some softer-than-kittens Misti Alpaca Chunky so I can go back and get me some of that. Remember how soft I said the Malabrigo Worsted is? This is softer. By an order of magnitude. Size: I made the largest size so the fabric would overlap more when I wrapped it around my waist. I've dubbed this "Ganesha Wrap" because my favorite Hindu deity is Ganesha, the god of new beginnings, travelers, wisdom and light. He's also the remover of obstacles and is a purveyor of success. Before a big journey, whether physical or metaphorical, I always like to invoke the spirt of Ganesha for good measure. This was the my first lace project, and it really pushed the limits of desire, concentration and surrender. If I wanted something so badly, could I really make it happen? If I concentrate, can I get through a row without unknitting. If I surrender and trust the pattern, will it all come together? There's not a single thing about this skirt that I'd ever done before. New to lace, new to provisional crochet cast on, new to I-chord bind off, new to tape-style yarn. All of it. I've gained a heck of a lot of knowledge and wisdom not only about knitting but also of myself. I first saw this pattern around the time that I decided that I wanted to change careers and teach yoga as my primary occupation. This skirt is a small homage to this new beginning, and it seems fitting that I managed to finish it on the eve of our return to the Washington, D.C..
And how desperate was I to finish this puppy? Aside from knitting a row or two here and there since early July, I hadn't really found the time to work on this. If I was going to finish this before next Tuesday, I needed to step it up a couple of notches. I threw myself at it all day and night Monday and Tuesday. I needed to block it Wednesday or I was going to lose my blocking surface for 6 weeks. In the midst of moving chaos, I pushed through and it's done. My blocking surface (AKA dining room table) was one of the first things the movers disassembled and packed. I mentioned previously that knitting the lace pattern stressed me out. The first few rows were a bear. The pattern didn't make sense, and it didn't look like anything you'd want to wear. Once I got about 20 rows in, though, it eased up and I could see the overall pattern take shape. However, this is still full-concentration knitting. Each row is a bit different. You can memorize bits of it, but you always have to consult the pattern. 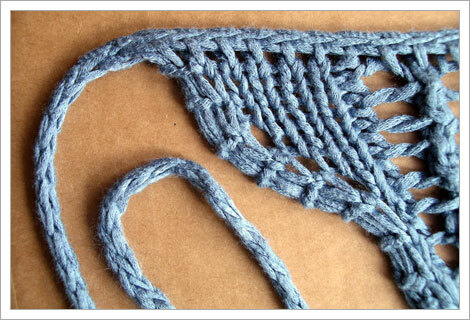 However, the I-chord bind off is super cool, and I was really glad to tick off that new technique. I love how the chord along the top edging morphs into the tie. I'll refrain from saying definitively that I hate the provisional crochet cast on, but my cranky, knitting-stressful-lace-for-two-days-straight self burst into tears as I fought to unravel the crochet chain and pick up the stitches along the bottom. Because the lace pattern starts immediately with the first row, there weren't just simple stockinette stitches to pick up. I couldn't tell exactly what to grab. I know for certain that I didn't always pick up the right bits of yarn, but I challenge anyone to notice. The project didn't end on a high note, and that's a bit disappointing. Yet, the final result is fantastic, and I love it. As noted above, this is my first time knitting with "tape" yarn. I realized pretty quickly that when I knit, I twist the yarn a lot. It doesn't take too long before the tape becomes this twisted, ridged string stuff. So, every couple of rows I had to untwist it. That was a bugger. But the 100% bamboo fabric is beyond soft, and it has a lovely drape. There's more weight to it than you might think, so be careful when knitting up big projects. The skirt is already stretching a bit from its own heaviness. Take heed. This yarn is a dramatically different animal when wet. It stiffens up like, well, wood. So, if you're thinking of knitting this as a beach wrap, you should consider substituting the yarn for something more water friendly. 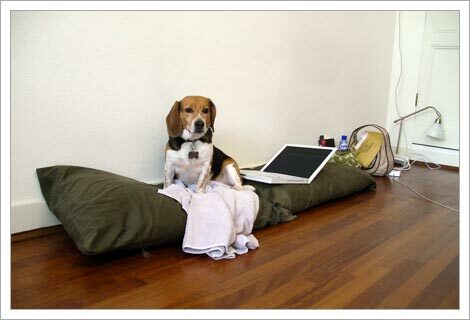 Here's a shot of Nigel on our make-shift "sofa". He thought it was great fun following the packers around for two days. I think he's a bit confused now that the place is empty. 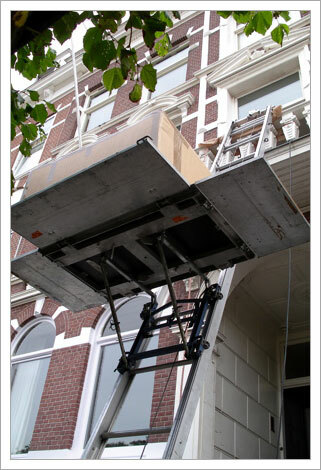 And if you're curious how people move their furniture out of typical, Dutch row houses, here's a hint. The Summer gift knits are complete. I present to you my step-mother-in-law, J's, Liebchen* Socks. Pattern: Baby Cable Rib from "Sensational Knitted Socks"
I'm really pleased with how these turned out, and my only wish is that I had sock blockers and sunshine to really show them off. 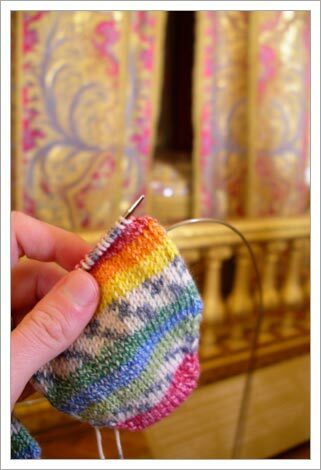 Most of the stitch patterns in "Sensational Knitted Socks", particularly the 4-stitch ones, are super easy to memorize. The Baby Cable Rib is only a very slight variation on 2x2 ribbing, so as long as you remember to do something a little bit different every four rows, you're golden. The problem for me is that I'm really slow at ribbing, so these felt like they took forever. Or it might have been the 80 stitch circumference. Yow! But the real highlight is the heel. 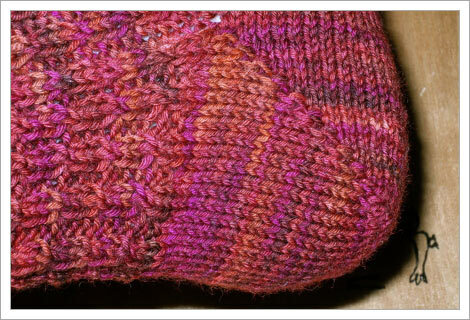 I mentioned before that I was going to go easy on myself and do a short-row heel. Of course that didn't mean that I was happy with the heels I'd used so far. On a whim, I took a look at the heel Wendy uses. And joy of joys, Wendy's heel does not create holes in the short rows! Look!!! You still wrap and turn, but you slip the first stitch after the turn. Somehow this plugs up the holes. I love it. I wish I'd gotten around to checking out her pattern before. I've done my fair share of drooling over the Wollmeise yarn, so I'm going to refrain from gushing. However, I really can't say enough good things about it. The base yarn is 100% wool, but it's not fuzzy. So the stitch definition is incredible. And while the skein isn't snuggly, the knitted fabric is very smooth and squishy. It's not at all itchy, but it feels sturdy. I think these will wear very well. Then there's the color. The yarn is so well dyed, no little spots of white poking out. I'm also ecstatic at how even the colorway knit up. 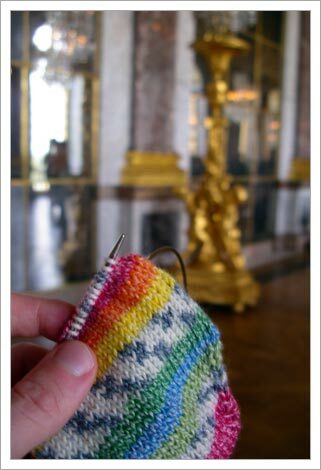 It's definitely a variegated yarn, but there's zero pooling anywhere on either sock. The hue is rich and saturated, definitely eye catching. Hopefully J really meant red when she said she wanted red socks. I need to give these puppies a wash and pick out all the dog and cat hairs that found their way into the fabric. If the sun pokes through the clouds before I mail them off this week, I'll try to get some better photos. I feel like I'm just not doing them justice. You might have to order some Wollmeise to see the magic for yourself. * By they way, I do not call my step-mother-in-law "liebchen." It'd be like calling her "darling," and I don't have to tell you how weird that would be. 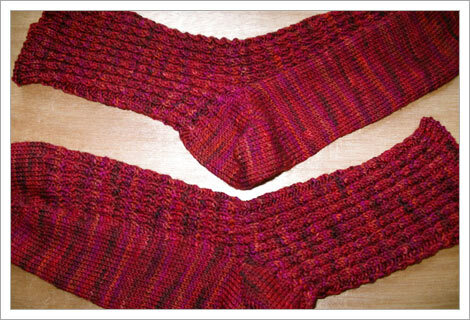 The socks, in Baby Cable Rib, are my little darlings. I'm a bit sad to send them on their way, but I'm sure they'll have a happy home in Australia. Besides, they're way too big for me.